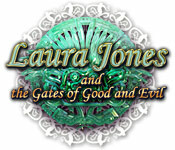 There is some interesting fantasy art in Laura Jones and the Gates of Good and Evil scattered throughout the game as it takes Laura Jones into strange dream sequences and surreal places for hidden object games or puzzle minigames. The final area also has an Aztec or Mayan look and curious puzzles. This fantasy art page for Laura Jones and the Gates of Good and Evil has screenshots of the more fantastic locations in the game. The other scenes in the game occur in mundane university settings, and are not of relevance as fantasy art.